Use 100% Of Your Emotional Intelligence! Order and download this entire audio program. Years ago, Katherine Hepburn said, “One learns as they go through life, that if you don’t paddle your own canoe, you don’t move.” So it is with managing situations that provoke us or push our buttons. We must manage us. One of the ways this is done is by managing what is called your ’emotional intelligence’. For better or worse, in all communications within the situations you encounter, you must manage yourself. We must handle the things that go on inside–no matter how the other person is acting or reacting. Learn how to deepen your confidence in your ability to manage situations! There are a few core components central to emotional intelligence. One aspect is that we have to catch our own emotional state. We have to be self-aware. We have to recognize the feelings as they come up. That really is the cornerstone of emotional intelligence. Frequently, we aren’t paying attention. I will bet there are many times through your day that you are totally unaware of what’s going on inside of you emotionally. You just react. You get triggered by the situation (positively and negatively) and with no forethought you just speak or act out. The second component of emotional intelligence is managing ones’ emotions when they occur. When an emotion arises, you have to be able to handle it. As it comes up you’ve got to do something with it, by directing it where you want it to go. Most people have no idea where their emotions come from. They just erupt and they respond to whatever emotion has surface. It is essential to find ways to better manage them. You need to take back control of your mind, and thereby your life, by having better management of your emotional state as it appears. The third part of emotional intelligence is motivating oneself. You have to marshal a motivated state as needed. Motivation is an inside job. Motivation occurs because you see something you believe is worth your time and attention, and you go for it. You need to manage your emotions so you can move you when you must get going. Learn 6 tactics that instantly increase your resilience to managing change or hardship! There’s nobody who can move you except you. So first, you have to notice what’s going on with you emotionally. Second, you have to be able to manage those emotions when they arise so you feel good about your self and your situation most of the time. And from that personal control you can third, move yourself and get you going when you need to so you can achieve worthwhile goals. Motivating yourself is crucial to living a well functioning personal and professional life. The fourth aspect of emotional intelligence is recognizing emotions in others. If you can’t even catch what’s going on within you, how in the heck can you recognize what’s going on with someone else? Empathy is a built-in perspective. We need to be able to look at the other person’s situation and find out what’s happening with them and what can be done to make it better. So as you look at the people around you and observe what they are doing, you will better understand the situation when viewed from his or her perspective. Not from just thinking about what’s being observed from your own perspective, your own limited point-of-view. The fifth component of emotional intelligence is learning to appropriately manage our relationships. You need to develop skill in managing relationships and communications. Because managing relationships is central to building your credibility, your leadership effectiveness, your team interactions and your interpersonal readiness. You need to find ways to manage all five aspects of emotional intelligence because they set you up to win. You’ve got to catch what’s going on with you emotionally. You’ve got to be able to manage any emotion that arises. You need to be able to motivate and move you forward toward positive achievement. You need to be able to recognize what’s happening with other people, and in turn be able to manage your relationships. All of these are central to dealing with other people, especially when they’re trying to push your buttons or get the best of you. Has this program caught your interest? Just can’t wait to hear the next segment? Or perhaps you’d like to download the entire program to your phone or tablet and listen during your travels? You can purchase and immediately receive this entire program as a digital download. Order Now: I’ve Only Got Three Nerves Left! Have you ever felt overwhelmed and had a hard time breaking free from it? What if there was a proven technique you could use that calms you in 2 to 5 minutes—would you want to learn it? Would knowing 6 ways to increase resilience when unexpected change occurs be of help? 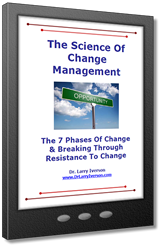 Psychologist and author, Dr. Larry Iverson has worked with over a million people in the last 30 years helping them create better lives through proactively managing and driving change. Apply the strategies in 7 Powerful Strategies for Managing the Rapids of Change and gain better control beginning today! Learn 4 common practices used by people who are over 100 years old for managing change. Learn 6 tactics that instantly increase your resilience to managing change or hardship. Understand the 7 phases all change goes through, and how to better deal with them. Learn why overwhelm happens, and how to overcome it easier and faster. Know the #1 strategy for not just surviving change, but how to thrive during change. Posted: July 4th, 2018 under Audio Programs.